HE was born in a well-to-do family, with an aerial view of life and saving was part of Ariel Sibanda's culture as he grew up in the Nketa area of Bulawayo. The 29-year-old Sibanda, who drives around in a sleek BMW X5, has worn no other jersey except the Highlanders strip and has kissed no other club badge except the famous "Siyinqaba" inscribed shield and arrow logo in his near decade Premiership career. Sibanda has also divided opinion amongst the Bosso faithful since making his debut in 2009 but his newfound form has largely contributed to Highlanders' ascendancy on the log table, at a time the club's financial debt is falling significantly. The former Warriors number one has kept 10 clean sheets in the 18 matches he has featured for Bosso this season, including the two recent ones against Herentals and Triangle, which saw "Tshilamoya" ease back into the top four ahead of next week's blockbuster clash against eternal rivals Dynamos at Barbourfields. But life as a goalkeeper is not an easy one and Sibanda is quick to acknowledge the plight of the men between the sticks. "We (goalies) are judged every day, today you are a hero and tomorrow you are reduced to zero just because you have made a mistake. 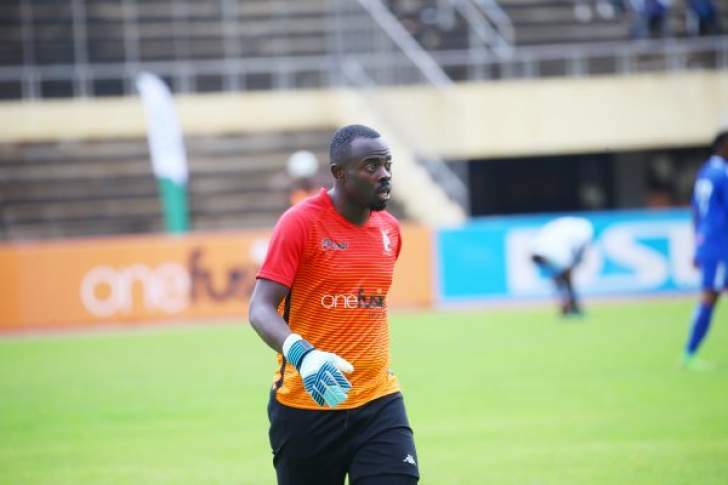 "That's the life of a goalkeeper, what is important is to build one's confidence from that criticism because criticism makes you a better keeper in the future," Sibanda told The Sunday Mail during the week. Sibanda was reduced to a zero a few weeks ago, specifically on June 10 when he was red carded in the 0-1 defeat to Bulawayo Chiefs for handling outside the box. That howler coming a few matches after he was accused of gifting ZPC Kariba the 2-1 win at BF. Bosso coach Madinda Ndlovu stood in Sibanda's corner and after missing Bosso's two losses against FC Platinum and Black Rhinos, Sibanda redeemed himself. He kept two consecutive clean sheets against Herentals and Triangle, to take his tally to 10. "Sometimes you have a bad day in office but I would say my performances so far have not been that bad although I know I can do better," said the 2012 Goalkeeper of the Year. Bosso's two consecutive victories against Herentals and Triangle pushed the Bulawayo giants to 35 points and 11 behind log leaders FC Platinum with 14 games still to play. Highlanders host DeMbare next Sunday knowing a win could as well as keep them within shouting distance in the 2018 castle Lager Premier Soccer League race. But the league title, which has eluded Sibanda in his nine-year dance on the Premiership stage, is not something Bosso are thinking about this season. "Honestly, we are not focusing on the title. We are just focusing on winning the remaining games but if it happens that we end up clinching the championship, then it will be a bonus for the supporters. "Next up is Dynamos, yeah it's a massive game, one that every Bosso player cherishes but we will prepare for it like any other game," noted Sibanda. There is no doubt the Highlanders shot stopper is one of the most experienced keepers in the land, but Sibanda acknowledges a number of top notch keepers have emerged and predicts a tough contest for the 2018 Goalkeeper of the Year award. Ngezi Platinum Stars' Donovan Bernard and Prosper Chigumba of Caps United are some of the goalkeepers who have performed well this season. "Tough competition indeed for that award but I haven't thought about it for now. I still need to improve," remarked Sibanda. A conversation with Sibanda always wanders into his love for BMW vehicles and of course that baptism of fire in Luanda on that hot afternoon of October 14, 2012 when he was punished by former Manchester United striker Manucho. Then 22, Sibanda was the Warriors number one when Zimbabwe - carrying a seemingly healthy 3-1 lead over Angola and looking headed for the 2013 Afcon finals - were blown away 2-0 in a three-minute blitz that saw Manucho score two headers inside the first seven minutes of the return leg in Luanda. "That's one of the most painful games I have ever endured, I can never forget that day but that's football, you learn as you grow." Apart from his crucial saves for Bosso, one thing that his teammates respect Sibanda for is his humility despite coming from a well-up family. "Yeah, I was brought up well but the most important thing my father and aunt taught me was to be humble. "And a lot of people say I am humble but that's not for me to say," says the father of two-year-old Ariel junior.